Your application might have multi-step tasks for users. For example, your app might need to guide users through purchasing additional content, or setting up a complex configuration setting, or simply confirming a decision. All of these tasks require walking users through one or more ordered steps or decisions. The v17 Leanback support library provides classes to implement multi-step user tasks. This lesson discusses how to use the GuidedStepFragment class to guide a user through a series of decisions to accomplish a task. GuidedStepFragment uses TV UI best practices to make multi-step tasks easy to understand and navigate on TV devices. A GuidedStepFragment represents a single step in a series of steps. Visually it provides a guidance view on the left with step information. On the right, GuidedStepFragment provides a view containing a list of possible actions or decisions for this step. Figure 1. An example guided step. For each step in your multi-step task, extend GuidedStepFragment and provide context information about the step and actions the user can take. Override onCreateGuidance() and return a new GuidanceStylist.Guidance that contains context information, such as the step title, description, and icon. Add your GuidedStepFragment subclass to your desired activity by calling GuidedStepFragment.add() in your activity’s onCreate() method. If your activity contains only GuidedStepFragment objects, use GuidedStepFragment.addAsRoot() instead of add() to add the first GuidedStepFragment. Using addAsRoot() ensures that if the user presses the Back button on the TV remote when viewing the first GuidedStepFragment, both the GuidedStepFragment and the parent activity will close. Note: Add GuidedStepFragment objects programmatically and not in your layout XML files. Add user actions by overriding onCreateActions(). In your override, add a new GuidedAction for each action item, and provide the action string, description, and ID. Use GuidedAction.Builder to add new actions. Add an information label action by setting infoOnly(true). If you set infoOnly to true, the user can't select the action. To provide additional information about user choices, use label actions. Add an editable text action by setting editable(true). If editable is true, when the action is selected the user can enter text using the remote or a connected keyboard. Override onGuidedActionEdited() or onGuidedActionEditedAndProceed() to get the modified text the user entered. Add a set of actions that behave as checkable radio buttons by using checkSetId() with a common ID value to group actions into a set. All actions in the same list with the same check-set ID are considered linked. When the user selects one of the actions within that set, that action becomes checked, while all other actions become unchecked. Add a date-picker action by using GuidedDatePickerAction.Builder instead of GuidedAction.Builder in onCreateActions(). Override onGuidedActionEdited() or onGuidedActionEditedAndProceed() to get the modified date value the user entered. Add an action that uses subactions to let the user pick from an extended list of choices. Subactions are described in Add subactions. Add a button action that appears to the right of the actions list and is easily accessible. Button actions are described in Add button actions. You can also add a visual indicator—to indicate that selecting the action leads to a new step—by setting hasNext(true). For all the different attributes that you can set, see GuidedAction. To respond to actions, override onGuidedActionClicked() and process the passed-in GuidedAction. Identify the selected action by examining GuidedAction.getId(). Some actions might require giving the user an additional set of choices. A GuidedAction can specify a list of subactions that get displayed as a drop-down list of child actions. Figure 2. Guided step subactions. The subaction list can contain regular actions or radio button actions, but not date-picker or editable text actions. Also, a subaction cannot have its own set of subactions as the system does not support more than one level of subactions. Deeply nested sets of actions create a poor user experience. // false to keep the drop-down list expanded. If your guided step has a large list of actions, users may have to scroll through the list to access the most commonly used actions. Use button actions to separate commonly used actions from the action list. Button actions appear to the right of the action list and are easy to navigate to. Figure 3. Guided step button actions. Button actions are created and handled just like regular actions, but you create button actions in onCreateButtonActions() instead of onCreateActions(). Respond to button actions in onGuidedActionClicked(). Use button actions for simple actions, such as navigation actions between steps. Don't use the date-picker action or other editable actions as button actions. Also, button actions cannot have subactions. A GuidedStepFragment represents a single step, however you might have several steps in an ordered sequence. Group multiple GuidedStepFragment objects together by using GuidedStepFragment.add() to add the next step in the sequence to the fragment stack. If the user presses the Back button on the TV remote, the device shows the previous GuidedStepFragment on the fragment stack. If you decide to provide your own GuidedAction that returns to the previous step, you can implement the Back behavior by calling getFragmentManager().popBackStack(). If you need to return the user to an even earlier step in the sequence, use popBackStackToGuidedStepFragment() to return to a specific GuidedStepFragment in the fragment stack. When the user has finished the last step in the sequence, use finishGuidedStepFragments() to remove all GuidedStepFragments from the current stack and return to the original parent activity. If the first GuidedStepFragment was added using addAsRoot(), calling finishGuidedStepFragments() will also close the parent activity. The GuidedStepFragment class can use custom themes that control presentation aspects such as title text formatting or step transition animations. Custom themes must inherit from Theme_Leanback_GuidedStep, and can provide overriding values for attributes defined in GuidanceStylist and GuidedActionsStylist. Apply the theme to the parent activity by setting the android:theme attribute to the activity element in the Android manifest. Setting this attribute applies the theme to all child views and is the easiest way to apply a custom theme if the parent activity contains only GuidedStepFragment objects. If your activity already uses a custom theme and you don’t want to apply GuidedStepFragment styles to other views in the activity, add the LeanbackGuidedStepTheme_guidedStepTheme attribute to your existing custom activity theme. 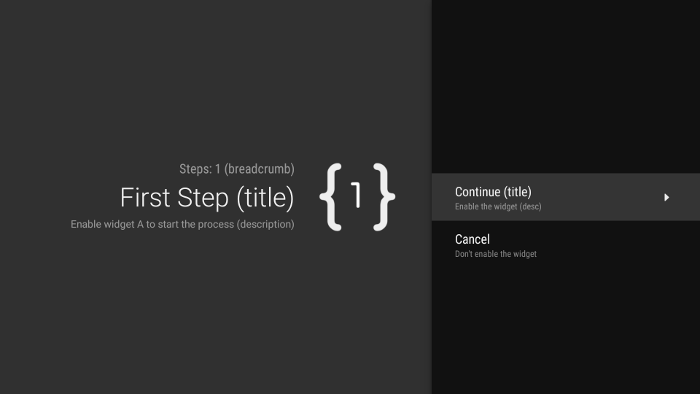 This attribute points to the custom theme that only the GuidedStepFragment objects in your activity use. If you use GuidedStepFragment objects in different activities that are part of the same overall multi-step task and want to use a consistent visual theme across all steps, override GuidedStepFragment.onProvideTheme() and return your custom theme. For more information on how to add styles and themes, see Styles and themes. The GuidedStepFragment class uses special stylist classes to access and apply theme attributes. The GuidanceStylist class uses theme information to control presentation of the left guidance view, while the GuidedActionsStylist class uses theme information to control presentation of the right actions view. 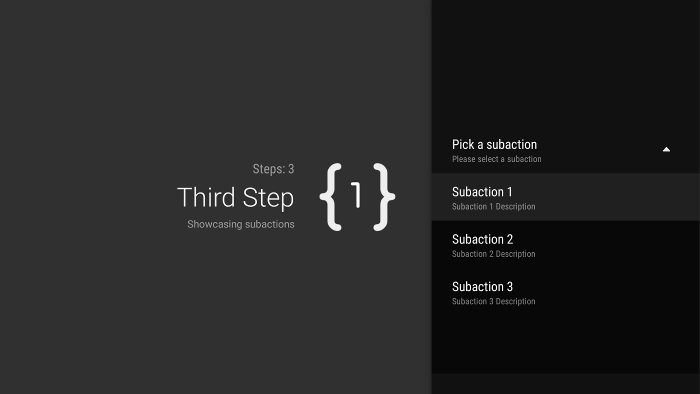 To customize the visual style of your steps beyond what theme customization can provide, subclass GuidanceStylist or GuidedActionsStylist and return your subclass in GuidedStepFragment.onCreateGuidanceStylist() or GuidedStepFragment.onCreateActionsStylist(). For details on what you can customize in these subclasses, see the documentation on GuidanceStylist and GuidedActionsStylist.